Dr. Wenstrup outperformed Jean’s best results in total vote percentage overall and vote percentage in Brown, Clermont and Hamilton Counties. Additionally, Brad outperformed Jean’s results in all shared counties in 2005, 2006 and 2008. Brad also got more total votes than Jean did in any of her campaigns. To restate that, Brad's 63.94% in Brown County was higher than Jean's best in that county, 60.2% in 2010. 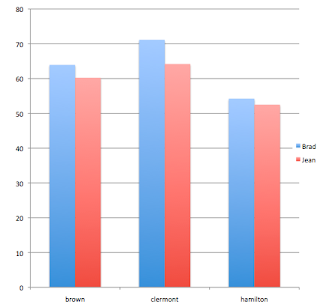 Brad's 54.22% in Hamilton County bested Jean's high of 52.49% in 2010. And the icing on the cake: Brad's 71.14% in Clermont County was higher than Jean's personal best 2010 result of 64.18% in her HOME COUNTY! Jean's best total vote result was in 2008: 148,671; this year, Brad got 189,400 votes. We also note that Jean never managed to perform up to her district. Until this year's redistricting took away Republican strongholds of Indian Hill, Symmes Township and Warren County, the Second District was considered to be a 64% R district. After redistricting, the Second District is considered to be a 57% R district. Jean never got anywhere near 64% of the vote, and yet Brad OVERPEFORMED his district by getting 59% of the vote. Even in 2010, a landslide year for Republicans nationwide and statewide, Jean managed only 58.45% in a district that was expected to produce a 64% R result. Now, rather than 6% below the baseline, Brad gets 2% above the baseline. We are so excited about our new Congressman, January 3 cannot come soon enough.